French Angora rabbits are one of the larger breeds of angora rabbits. They differ from the other breeds in size and placement of their wool as well as in their lower-maintenance coats. Once grouped together with English Angora rabbits and known simply as "Angora Wooler," the French Angora rabbit has long been considered its own breed. Prior to 1939, any rabbit capable of growing and producing a wool coat suitable for harvest was classified by the American Rabbit Breeders Association (ARBA) as an Angora Wooler. In 1939, differences and variation in the breed led to the breakdown of the breed into two categories: English Type and French Type. In 1944, ARBA officially declared the two types to be two separate rabbit breeds: The English Angora and the French Angora rabbit. French Angoras are the second largest of the ARBA recognized Angora rabbits. They weigh between 7-1/2 and 10-1/2 pounds with 8-1/2 pounds being the ideal weight. French Angoras have two coats of hair: a coarse guard hair, which extends past the undercoat, and a thick, crimped wool coat. The wool may grow as long as six inches but should be a minimum of two inches. Unlike the English Angora, which has thick wool covering its face, ears and feet, the French Angora's wool is confined largely to its body. The face and front feet from toes to ankles are clean of wool. The ears and hind legs may have some wool tufts, but this is discouraged amongst shown animals. French Angoras come in all colors including white, solid and broken. The color of the rabbit is determined by the color of its head, feet and tail, which should all be the same color. The toes of the rabbit should all be the same color: white for white rabbits or colored for colored rabbits. 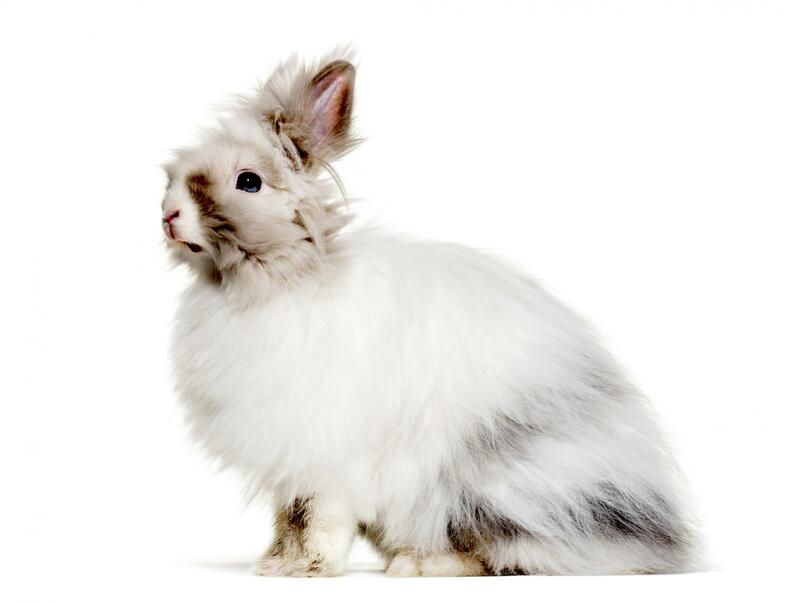 The French Angora rabbit was originally bred for two purposes: wool and meat. Therefore, the body of the rabbit should be oval shaped, firm, and strong. The head should also be oval shaped and in proportion to the body. French Angoras are typically mellow and gentle. Like other rabbits, the more they are handled, the more likely they are to become friendlier and more even-tempered. 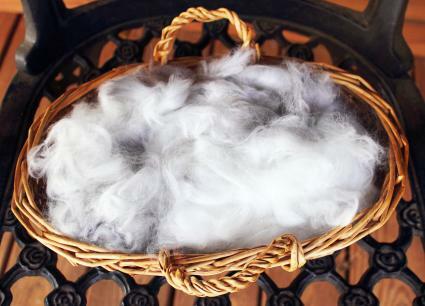 The regular grooming and fur maintenance required, as well as the harvesting of the wool, help to make the French Angora a sweet and gentle rabbit. Young rabbits between three and seven months of age can eat as much pellets and alfalfa hay as they like. One type of vegetable a day can be added to their diet as well. Rabbits seven months to one year of age should be switched over to timothy hay from alfalfa and they can have it in unlimited amounts. Pellets should no longer be unlimited but instead fed at a rate of 1/2 cup per six pounds of body weight. Vegetables can be fed at up to two cups per six pounds of weight and one to two ounces of fruit can be fed one or two times a week. Rabbits between one and six years should receive unlimited hay and 1/4 cup of pellets and two cups of vegetables per six pounds of weight daily. Fruit can be given up to twice a week in small amounts no larger than two ounces. Rabbits six years or older can follow the same diet as an adult rabbit as long as they remain healthy. If you see them starting to lose weight, you can increase their daily amount of pellets and also add in alfalfa until they begin maintaining a normal, healthy weight. If signs of wool block appear, consult your veterinarian immediately. If you are interested in acquiring a rabbit for showing, breeding or wool producing purposes, the French Angora breed is ideal for all three. The gentle temperament, combined with the lower-maintenance coat help to make this breed one that many people can handle.